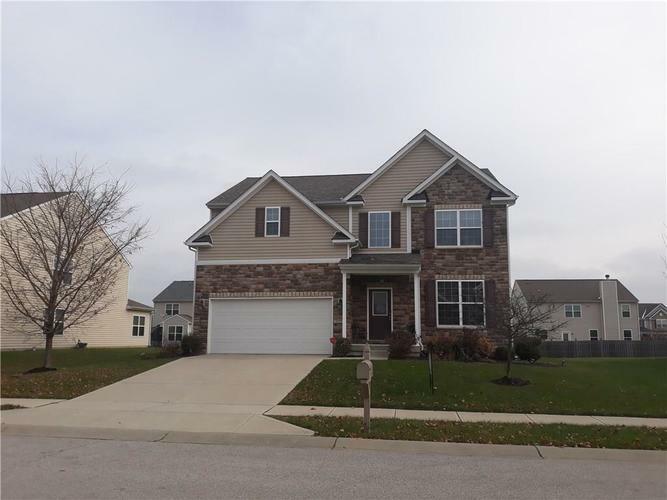 Well-kept two story home, with a full basement, in the Brownsburg school district. Home features arched entryways w/9ft ceilings throughout the first level. The kitchen has upgraded cabinets, laminate flooring, stainless steel appliances and a large pantry. Other features include a wood burning fireplace, office with double glass doors and a formal dining room. Upstairs opens into a loft is great for entertaining. The master suite is stunning with trey ceilings and bathroom with double sinks, separate shower and garden tub. also has an extra-large master bedroom walk-in closet- an astonishing 11 x 19 feet(rare;hard to find)! This home is move-in ready. The neighborhood has a huge playground, tennis courts, pool and soccer field. Directions:From56th and Raceway Rd. Drive South to Jamestown Rd. Drive 0.2 miles and turn right onto Goodwin Street. The destination will be on the right.